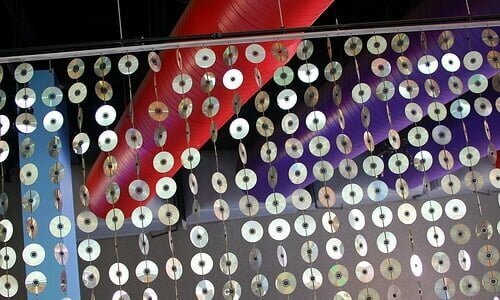 In today’s project we’re going to go over how you can go about making your very own “CD sculpture”. So what exactly is a CD sculpture? It’s any number of things – you can use this fun crafting idea to make a wall hanging, an intricate piece of art, or even a bead-like entry way. We really love this project because its very fun, very easy, and looks absolutely fantastic. So without further ado – let’s get right to it! Blank compact discs – you can find these anywhere they sell computer hardware. depending on the look you’re trying to go for. You’ll want to start off by tying off your pieces of rope or string to the rod you’ve prepared. You can do this by tying a loop with each piece of yarn and finishing up with a simple knot. Next you’ll want to thread the yarn through the center of the cd and back up, tying off a knot. Repeat this process and tie another knot on the opposite end. The result should be a cd that is suspended by the opposing knots and hangs in space along the string. Depending on how dense you’d like your compact disc sculpture to be, you can experiment with leaving varying amounts of space between each succeeding cd until you’re satisfied with the look. Upcycle your shower curtain into a beach bag!